This is the story of an amazing New York-Style Bagel Recipe. But it doesn’t just start there. It began with food blogger’s block (writer’s block, but for food bloggers)… The most frustrating thing for any food blogger. Many of us will not admit that we sometimes get it, but I find no problem with admitting that I occasionally get food blogger’s block. Why? Well, because I am far from perfect and showing small imperfections makes me normal. Doesn’t it make us all normal? Well, I am not *that* normal. Why? Because some of my friends and dearest family members call me the “crazy baker” because I occasionally have these moments where I try to bake anything and everything known to man. Okay… Exaggerating a bit… But I seriously do bake a bit too much… This past weekend, I decided that I was going to use all of the baking energy that I built up over the past couple of weeks to create some edible masterpieces to share with you all. The first edible masterpiece (I love how I call bagels edible masterpieces…) that I decided to share (out of the billion things that I baked) is an awesome bagel recipe that I adapted from a cookbook that I recently “borrowed” from my aunt, Ultimate Bread. Please notice that I put the word borrowed in quotations. I’ll elaborate… At first, the book was to be borrowed, but by the likes of it- she’s not getting it back for a long, long, long… Long time. This bagel recipe is not only one of the best bagel recipes that I’ve tried, but it doesn’t require a rocket scientist (sorry rocket scientists reading this… I like the saying!) to make the recipe. The bagels are awesome fresh out of the oven, but when they’re toasted… Oh, my! Can we just say that you’ll be making this bagel recipe time and time again? New Yorkers and People who would rather buy your bagels– sure, we have our awesome bagel shops. And it seems stupid to make something that takes more effort than walking down the block to our local bagel shop. But seriously… This bagel recipe is so worth making. Well, because when you make something on your own, don’t you feel a sense of accomplishment after you create an edible masterpiece? I know I do… Also, this may give some competition to your local bagel shop… The recipe’s that good! This bagel recipe is so good that you’ll be bowing down to the bagel god after you take a nice bite out of one of these freshly made bagels. Also, is there even a bagel god? Don’t even answer that… Nowadays, I wouldn’t be surprised if there was one! So, if you’re one of those people on the West-Coast who orders 12 bagels from New York and pays $7.50 a bagel… Save your money! This bagel recipe is a same-day recipe and doesn’t require two days of dedication. You hear that impatient bakers? ONE DAY bagels! 1. In ½ cup /120ml of the warm water, pour in the sugar and yeast. Do not stir. Let it sit for five minutes, and then stir the yeast and sugar mixture, until it all dissolves in the water. 2. Mix the flour and salt in a large bowl. Make a well in the middle and pour in the yeast and sugar mixture. 3. Pour 1/3 cup / 90ml of the remaining warm water into the well. Mix and stir in the rest of the water as needed. Depending on where you live, you may need to add anywhere from a couple tablespoons to about ¼ cup/60ml of water. You want a moist and firm dough after you have mixed it. 4. On a floured countertop, knead the dough for about 10 minutes until it is smooth and elastic. Try working in as much flour as possible to form a firm and stiff dough. 5. Lightly brush a large bowl with oil and turn the dough to coat. Cover the bowl with a damp dish towel. Let rise in a warm place for 1 hour, until the dough has doubled in size. Punch the dough down, and let it rest for another 10 minutes. 6. Carefully divide the dough into 8 pieces (I used a scale to be extra precise, but it’s not necessary). Shape each piece into a round. 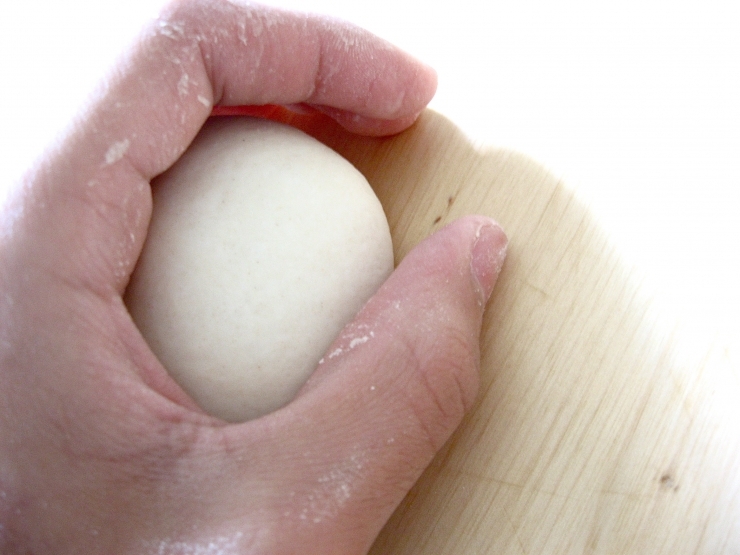 Now, take a dough ball, and press it gently against the countertop (or whatever work surface you’re using) moving your hand and the ball in a circular motion pulling the dough into itself while reducing the pressure on top of the dough slightly until a perfect dough ball forms (as pictured below). Repeat with 7 other dough rounds. 7. Coat a finger in flour, and gently press your finger into the center of each dough ball to form a ring. Stretch the ring to about ⅓ the diameter of the bagel and place on a lightly oiled cookie sheet. Repeat the same step with the remaining dough. 8. After shaping the dough rounds and placing them on the cookie sheet, cover with a damp kitchen towel and allow to rest for 10 minutes. Meanwhile, preheat your oven to 425ºF / 220ºC / Gas Mark 7. 9. Bring a large pot of water to a boil. Reduce the heat. 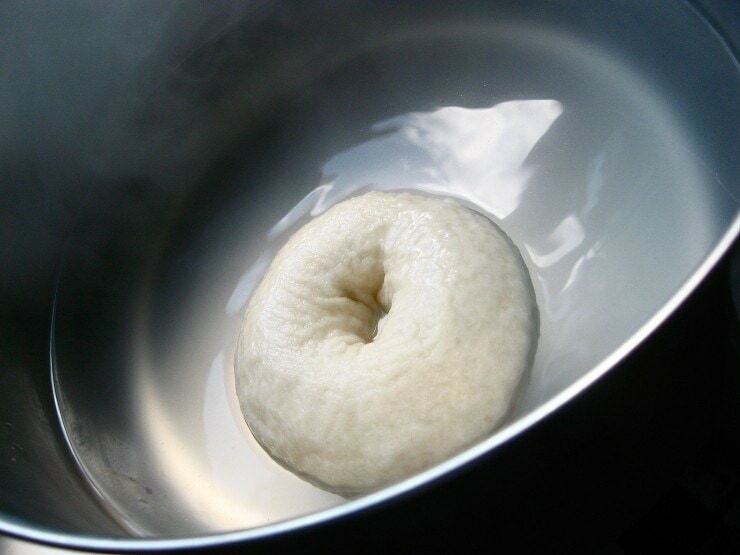 Use a slotted spoon or skimmer to lower the bagels into the water. Boil as many as you are comfortable with boiling. Once the bagels are in, it shouldn’t take too long for them to float to the top (a couple seconds). Let them sit there for 1 minute, and them flip them over to boil for another minute. Extend the boiling times to 2 minutes each, if you’d prefer a chewier bagel (results will give you a more New York Style bagel with this option). 10. If you want to top your bagels with stuff, do so as you take them out of the water, you may use the “optional toppings” (listed above) to top the bagels and if you’re risky like me, make a combination of the toppings to top the bagels with, but before hand, you will need to use an egg wash to get the toppings to stick before putting the bagels into the oven. 11. Once all the bagels have boiled (and have been topped with your choice of toppings), transfer them to a lightly oiled baking sheet. 12. Bake for 20 minutes, until golden brown. Update (March 4th, 2015): Being one of the most popular recipes on the site, these bagels had to make their way onto the pages of my book, Hand Made Baking. If you’re interested in checking out the updated recipe and other great (new!) recipes, head on over here for order links to the book. Love these bagels. I am a Montreal baker – would you like my Montreal bagel recipe to compare? thanks for the recipe. Not everyone lives in NYC – and for those of us who do not have a bagel shop within walking distance, we must make our own if we want to enjoy a decent bagel. We recently moved to VA and live in the country – the nearest bagel shop is in the next county!!! We could buy the grocery store bakery version of a bagel, or drive 30 minutes to dunkin donuts and buy their version of a real bagel (which aren’t that bad really), but it is so much easier and tastier to make them ourselves! I live in Poland and there is a lot of bread here but bagels are not really popular. So I found this wonderful recipe and YES they are delicious right out of the oven! I used half whole wheat and have bread flour. I needed to add extra water. But they turned out great! Now I need to go buy some good cream cheese! I’ve made these twice now and they are so delicious. Thanks for the recipe! cool.I had no idea they had to be boiled first, then baked..found that unique..will try now. Do you egg wash the bagels even if you are putting no toppings? Hi Adrian, egg washing the bagels without toppings isn’t needed. Very good recipe! I used whole wheat bread flour and used a little extra yeast and they turned out real well. The shape of my bagels were a little messy, but next batch I’ll know much better. A little problem: My bagels didn’t sink! It must have been the extra yeast…but I just boiled them for 1 and 1/2 minutes on each side instead. This recipe is simple and delicious! If you have a bread machine, it’s even easier. I cooked them in the evening, planning to have them ready for breakfast the next morning. They smelled so good I couldn’t resist trying just one, then proceeded to eat literally half the batch, straight off the baking sheet. Your recipe looks fantastic but I have an enquiry. Is it completely nessecery to let it rise for 1 WHOLE hour? Would it still be ok after 30 minutes? I ask this because I am planning to make these bagels for my coursework so a quick reply would be greatly appreciated! Traditionally, bagels do not have a full rise or barely rise at all. They have some ‘kick’ on the bench, then in the simmering kettle water and then one last gasp in the oven but they are meant to be chewy and dense. Not bready. Allowing bagels to rise is unauthentic for one thing but makes them bready and puffy instead of characteristically chewy and rustic. Bagels are over a century old and even today, this tradition of no rise (just barely 15 minutes bench time before rolling them NOT making a center hold ) is still respected in any commercial bagel bakery. Thank you so much for this recipe, Kamran! They turned out so well, and they smelled so good that we just had to break into them while they were hot! on the very few occasions that I bought a fresh bagel from a Jewish bakery in London I always wondered whether I could make them myself. the ones we can buy here at the supermarket bear no relation to fresh bagels whatsoever. I’d experimented with a few recipes, but this is the one. The Real Deal! thankyou very much for providing it. I’m making my fifth batch now and am very pleased with the results. I tried the recipe twice, one plain and the other with dried blueberries and cinnamon, and both turned out a success! Here in Spain, not everyone knows what bagels are and kinda difficult to get them in stores, so I am spreading out the recipe to a couple of my friends who are Bagel Freaks, too! Thanks for the great recipe! Made them this afternoon K…boy-o-boy…what fabulous bagels. Bowing down to the bagel god & to you too K. Thanks for sharing these so beautifully. Must try working in some whole wheat flour next time. have you tried that version? Nice post, Thank you so much for sharing and hope you add more like this soon. I literally just tried to make these, and during the bit where you have to let the dough sit in water for an hour, when I took a look at it after half an hour it was water-logged and had basically fallen apart. How much water is supposed to be in the bowl? I had the dough pretty much submerged, which might have been the problem. Also I’m wondering if using all-purpose flour instead of bread flour (which I can’t find anywhere) may have contributed to my failure? This recipe seems like a winner so if anyone has any good suggestions on how to make it work I’d really appreciate it. Lol. I’m sorry to laugh at your mistake, but it is quite humorous and gave me a good chuckle! Hope your next batch turned out much better! Oh wait, nevermind my last comment. I obviously misread the recipe, it says warm “place” not warm water. What a dummy. I had warm water on the brain after reading about the boiling bit. Okay, I’ll try again – this time I’ll be extra careful to actually read the instructions properly. Thanks for the recipe, would love to eat an authentic bagel again. Are the measurements in metric? I was wondering if you add baking soda,syrup, or honey in boiling water. How many bagels this recipe yields. Thank you for. The Recipe!!!! Onemore quick question, I dntthink I will be ableto ind bread flour will it work woth All-purpoe? Hi Alexandra- the recipe makes 8 medium-sized bagels (about 4 large bagels). All-purpose flour might work, but it might not be as great as a high-gluten flour, such as bread flour. If you can get your hands on whole wheat flour, maybe do half and half? Hope that helps! I just made these using an organic all purpose flour. They didn’t rise much during the hour but still came out great! They really do taste like a NY bagel – thanks for the hint about leaving them in the water longer for the chewy texture. (And I grew up in NY so I do know my bagels) I will try the bread flour next time and see if there is a difference in the rise. Hi Sandy, there should definitely be a rise difference in your bagels when using bread flour– there’s more gluten in bread flour, so that plays a big part in a strong rise. Just made these and they are perfect. Thanks for your recipe. Can the bagels be frozen after they have been boiled to store for later baking? Hi Liss, I’d actually par-bake the bagels if you’d prefer to store them for later baking. So maybe bake them until they are a faint gold tinge (about 10-15 minutes). There’s also another route that you can go- just bake the bagels all the way through. Allow them to cool completely. Pre-slice them, store them properly in a freezer-safe plastic bag, and let them thaw when needed. If you’re planning on toasting them, I don’t even think you need to bother thawing the bagels. I just tried this recipe out and the outcome was great! In the words of Travis Birkenstock, “Two very enthusiastic thumbs up (clueless quote). How do you store them so that they are fresh the next morning? I usually bake them in the morning; a zip-lock bag works well (be sure to take all of the air out!). Excellent! I baked these last night and cannot stop eating them (that is NOT excellent ;) This recipe was very easy to follow and I had all the ingredients on hand. I am going to make a second batch today since some are in the freezer for friends and the rest don’t stand a chance to make it past another day. Who would have thought bagels could be so easy to make? Bye bye, store-bought bagels. Thanks for this wonderful, easy recipe! AMAZING bagels! Got a taste for them when I was in the US, now back in NZ they are rare and expensive, but these are so easy and tasty!!! I’m going to try these as soon as the weather cooperates. In addition to the plain variety, we like cinnamon raisin bagels too. Could anyone tell me how I could adapt this recipe? I’ve been receiving a lot of emails about this, Michelle. I promise another bagel post (cinnamon raisin) within the next couple weeks, so stay tuned! I made these yesterday and they are fantastic! I was so worried they wouldn’t turn out but they’re so pretty and so tasty. Have you ever tried to put anything in the batter? I was thinking about trying blueberry bagels. I would probably have to use dried blueberries I guess. Hi Casey- you can fold in dried blueberries or fresh blueberries… If using fresh, I’d recommend using a smaller variety of blueberries. Amazed by how high the success rate of your bagels! So many happy faces here from around the world. Just one quick question, if I were to add blueberries (attempt to add fresh ones), which step should I fold them in? First proof or second proof? Also, since blueberries contains pulps and juice, would you recommend to reduce water? If so, how much less? One last question, I heard some people add barley malt syrup and baking soda during the boiling process. Have you tried that? Wonder why and how they will affect the results! I made these last night! I added asiago cheese to the batter and to the outside. Then after baking, I sliced them and put chicken and cheddar cheese inside and baked again for 7 minutes! They were awesome!!! Made these last night for the first time and they turned out great! Delicious!!!! We will be making our own bagels from now on. however i’m from India and we do not get Bread Flour here per-se..i read from one of your replies above that high-gluten flour or whole wheat flour can be used..am i correct? since in India we have an abundance of whole wheat flour (atta in India) is it ok to use that instead of bread flour, or would you recommend some other way? looking forward t your reply! can I use regular sugar instead of granulated? in the US, granulated sugar is considered regular sugar. So, if you mean superfine / caster sugar, yes, you can. i LOVE this recipe. i found it while living in rome, where there are no bagels and my italian roommates devoured them…the recipe reminded me of home…now i am back in the states and enjoying them again…grazie. Hi there- I visited just about one and only real Bagel shop in South Africa (called New York Bagels) – I left with 30 bagels….loved it, but is not 100% as I remember them – a bit toooooo chewy – so now I’m hooked and will bake my own till I’m able to get it 100% (I’m not a natural cook, but love a challenge)!! There is no bagel culture in SA and always wondered why?? I’m so tired of muffins…..!!! tried the recipe today & turned out great! I couldn’t get them to look as nice & round as yours but they tasted yummy. it’s difficult to find nice bagels in sydney…so I’m sure I’ll get lots of use of the recipe. thanks! Yummo, i live in Tasmania and there isn’t a bakery im aware of that sells bagels, so i have been forced into buying the supermarket variety that are suitable for toastong but not really to eat fresh. i will try this recipe and hopefully it will be a sucessful endeavour!! Thank you so much for this great recipe! This is my second try at baking bagel. I am a novice baker and tried another bagel recipe with not much success but with yours it is coming out beautiful. Only a few minutes left in the oven and I cant wait to taste them!! I made slight variation sub 1 cup Wholewheat with normal bread flour, added a pinch more yeast, and added about a handful dried rasperry. They came out gorgeous and tasted divine!! Thank you!! I just tried these today and they are awesome!! First time ever making bagels, but definitely not the last! This recipe is a keeper. I bake all the bread we eat in our house (sourdough, usually), as well as sandwich buns, and many other things, but I’ve always bought bagels, because I thought I couldn’t make them. Well, when the place where I bought them went “under” it was time to try to make them myself, and your recipe is fantastic! Easy to follow and they taste great! Thanks! I just tried your recipe “as is” with great results. I used whole wheat bread flour (so gave brown color) and in boil bagels did not come up. But the taste was delicious. Thanks and please provide us with more bagel recipes (with raisins, etc). Hi! I just made these with about a quarter cup of sugar and cinnamon. Then I brushed with egg and sprinkled brown sugar, regular sugar, raw sugar and cinnamon on top. They came out better than Panara Bread’s cinnamon crunch bagel. Thanks so much for this recipe. This is the one I’ve been looking for! Living in London you just CANNOT get bagels here like you do back in the US (they’re more like bread rolls which in my book does not a bagel make). So I’ve scoured the internet for a recipe that wouldn’t intimidate this novice bread maker. Your recipe and its easy to follow steps encouraged me to take the plunge and hoo boy am I glad i did! I’ve now made them several times for Brits and Yanks alike and everyone loves them. My parents (who are from Queens) said they were “just like the ones in the old neighborhood” and that’s high praise indeed. I now make a slight tweak to the recipe and make the dough the night before, pop it in the fridge to allow for a cold rise, and take the dough out in the morning and then follow all other steps. Thanks!! Since a recent trip to America, where I discovered bagels for the first time, I have been craving more. Sadly, not many places in Australia sell them, especially in my little town! So, I’m very happy to find an easy, highly-rated recipe. I’ll definitely be trying these this weekend!! My niece, Lindsay, has made your recipe several times and has raved about the results! Plan to try it out myself. Thanks for sharing. Can I use mixer instead of knead? Hi Mrs Ong- You surely can; just be sure to keep an eye on the dough while it’s in the stand mixer because you don’t want the dough to be over-kneaded. After trying a different recipe this morning, I just found your site and am going to make these next! I want one that tastes like Panera Bread’s French Toast Bagel — any idea how to accomplish this? The recipe I tried used maple extract & cinnamon but it came out with no flavor at all. Hi Vicky- I wouldn’t know how their French Toast Bagel tastes (it sounds amazing, though), as I’ve only eaten at Panera once before (2 years ago. I had a salad). I did, however, do a quick search, and saw that they use a combination of maple & cinnamon-flavored chips.I believe the King Arthur Flour website sells cinnamon flavored chips and maple white chocolate baking chips; I think that Hershey’s also makes the cinnamon-flavored one’s, too. I tried searching for the maple baking chips to see if they were easily available online, as I’m not sure if they use the white chocolate variety at Panera, but from what I see, the chips are made from maple sugar, which I think would be an excellent alternative to the maple chips. I really must try to re-create these bagels now that you’ve been brought these to my attention. I mean- who can say no to portable, no-mess, french toast? I can’t believe I didn’t think of cinnamon chips! We have a small Amish store that sells them and I use them all the time -they make the most wonderful pancakes you’ve ever eaten. And I make cinnamon chip scones – sold also at Panera. I’m heading to my kitchen to start another batch of bagels and will follow up with my results. Thanks for your quick response!! I´m from México and today I made this bagels, the result is very, very good, my family enjoyed them very much, thank you for this recipe. Using your EXCELLENT bagel recipe, I added 1 1/2 cups cinnamon chips and 1 1/2 tablespoon natural maple flavoring – yummo! I mixed in the chips with my KA in the last few minutes of kneading but next time will knead them in by hand instead. Searching for maple chips was interesting. The Prepared Pantry told me the manufacturer has discontinued them and they don’t know of any other source. Wonder if Panera has another supplier – maybe I’ll contact them and try to purchase some. I think they would make my bagels just like Panera’s! Yum! I am a NY’er and the city is seriously the only place to get a decent bagel until now. I don’t live anywhere near NY now and have always just settled for a bagel. My husband is a Police Officer and loves to take a bagel with some cream cheese and my jam for breakfast. $6/week for crummy bagels was killing me! No more! This was really easy and mine came out so grew the first time! I used my KA with no issues. I didn’t spray plastic enough so they slightly stuck but I was able to get it off with minimal damage. After the first three I realized I needed to redo my hole before boiling. I made plain, salt and everything. After we ate 2 hot from the oven I sliced the rest, wrapped in foil then froze in a freezer bag. Just pulled one out tonight for Hubs to take to work. Had one myself, thawed in microwave 20 secs then lightly toasted. Tasted fresh from the oven. So excited I found this recipe! Just doubled this recipe..amazing!! Just about to eat one now… I had no trouble what-so-ever with this recipe.. the dought was perfect!!! Thank you!! I live in Damascus, Syria with my husband & son. We miss bagels the most, they r the first thing we think of when we remember our visits to NYC. This recipe was really good, I promised I’ll b making it for them once week. But I rolled the dough into a tube-like shape then pinched it together, because I tried to hollow out a ball & it always closes up when boiling. The rolled dough didn’t come out as smooth as ur picture. Is there a trick to rolling them? I made another batch of French Toast Bagels today. Seems that it always takes a couple tries to tweak it to my satisfaction! I omitted the maple flavor and instead added a scant 1/4 cup Log Cabin maple syrup. YUMMO!!! Now the maple flavor comes through like I wanted! Thanks again for your original recipe – I’m going to be trying lots of different flavors with this! Jalapeno Cheddar, Cranberry Walnut, gosh, what else? Thank you so much for this delicious recipe. I live in Norway so bagels are hard to come across and expensive if you are lucky enough to find one.. So it was fantastic to have them fresh in my own kitchen! (A resent trip to the US had left me with a bad bagel craving). I’ve been wanting to make bagels for a long time but did not dare to until now. I followed all your nice instructions and they turned out beautifully! I only had all purpose flour but I added two teaspoons of wheat gluten from the health food store and I think that worked well. Used my Kenwood for kneading and that seems to work fine.. Thanks again! Thanks for the fairly straightforward recipe. I think i followed it pretty precisely, however, despite letting the bagels boil for a good 2min on each side, they didn’t come out as chewy as a real bagel. They were more like really nice rolls with a hole in the middle. They were absolutely delicious, but perhaps i’ve not kneaded them enough or let rise enough?? Any advice? thank you! Hi Stephanie, from the sound of it, it seems that you may have not kneaded enough flour into the dough, or as you pointed out- you might have not kneaded the dough enough. As for the rise, that could play a role in it. If you have a large straight edged container, I’d put the dough in there, mark it.. Once it’s doubled in size, it’ll be easy to tell. I don’t think your rise changed the outcome of the bagels, though, I suspect you didn’t add enough flour to the dough, while kneading. Hi, i tried your recipe with the ingredients i found in europe (i bought the only flour warning it could contain gluten) and i added less water than you. Well, maybe my conversion to ml was wrong… Plus i used a kitchen aid artisan for the first part of kneading. Anyway, the result is amazing. Thank you very much for sharing this recipe, these bagels were just awesome. I made this recipe the other day. We are New Yorkers and my husband is fairly picky about our bagels (even in NY) so you know we were skeptical that they would be any good at all. They hardly stayed bagel-shaped once I boiled them, but that was due to me not knowing what I was doing. The taste… Well, let’s just say my husband went out and got toppings for me to apply to the next batch. I had never used bread flour before this recipe so I tried some with and some with all-purpose. The bread flour does make a difference in the texture (for the better). Also, the second round, we boiled them a little longer on each side and increased the size of each bagel. I would say the recipe yields 6 NY sized bagels. Next, I am taking a stab at cinnamon raisin bagels. Thanks for the easy and delicious recipe. What if I used all purpose flour and added some vital wheat gluten? I’ve never tried doing that before but I feel like it might work. Reading this made me need a bagel, like now. I don’t want to go to the store. No time for that. Hi Lena- that would work! Oh it worked. I made the [email protected]#$ out of those bagels! We at them with butter and homemade fig preserves. 3 people, 8 bagels, 1 hour…gone. I was looking for an easy recipe for bagels & saw this one. After reading all the comments I can’t wait to try it out. The only problem is that I can’t buy bread flour here. However, the baking stores do sell gluten. Any idea how much I should add per cup of all purpose flour? Thank you. Hi Ratika, I think Marie already answered your question before I got to (thanks Marie), but 30g or thereabouts seems correct. Best bagel ever. Seriously. I have a question. Is it possible to make the dough in evening and bake next morning OR 2 mornings later? My boys want these for lunchboxes and I cannot make them every other day. What is the best storage to prevent them going stale? Fridge? Freezer? Thanks much! Hi Cynthia- If you want to make the dough in the evening, and bake it the next morning, you can do so by putting the dough to rise in the refrigerator over night; I wouldn’t do it 2 mornings later, though. As for preventing them from going stale- I’d go with the freezing method mentioned above; whenever I make bagels, we normally end up eating the entire batch before we can store them for eating later in the week, but plastic bags (with the air removed) do help every bit. Hello Hello! Great recipe! My dough consistency was perfect followed the recipe to the T and they came out looking perfect!!! The taste though…..While they were good they were a bit yeasty with a little weird taste (I’m guessing the yeast. This is my first time baking with yeast ha!). Know I now the recipe isn’t at fault! Im sure i did something wrong! So is there anything i could do to make them less yeasty? Any tips? I did a bit of googling and some suggestions included letting it rest for less time or maybe not letting the yeast, water and sugar sit for too long? Or maybe they just needed to be in the oven longer? Maybe I used too much yeast (2 teaspoons). Not really sure! They look amazing and I’m definitely using this recipe again and getting them perfect! Thanks in advance! Hi Chris- I think that’s just the taste, more so the smell, of fresh yeast-made anything. It tastes and smells a little yeasty once out of the oven, but as it cools, it loses that yeasty taste a bit, but I think that smell and taste is one of the beauties of bread making… If you were to stop at your neighborhood bakery, and they pulled a batch of bagels or any type of bread out of the oven and handed it to you, you’d get the same smell and taste. I’ll be updating the recipe soon, for those overseas who weigh their ingredients for a bit more accuracy (which I do now with a lot of my recipes). I am 2 months pregnant and have been craving a good bagel lately. Unfortunately I no longer live on the east coast where the good ones are. So when I found this recipe I was so happy, and even more so when I took my first bite. I don’t think I will ever buy bagels again. I don’t know if it is the pregnancy or that this recipe is that good. But I did a happy dance in my kitchen because they are so good. Thank you, thank you, thank you so much sophisticatedgourmet.com you made me very happy. Thanks for posting this recipe! I’m going to try it today. What kind of egg wash do you recommend for putting on the toppings? Hi Lynne- You don’t need anything too complicated. Just a beaten egg and about a teaspoon or so of water- just enough to thin-out the beaten egg a bit. I just made these bagels yesterday and they were so delicious! I will never buy a store bough bagel again. I was wondering tho if you have experimented with adding toppings into the dough (ie onions, blueberries, garlic) instead of putting them on top. So, I finally made these last week. They didn’t turn out so great & I think I know where I may have gone wrong. Firstly, after kneading I put the dough into an oiled bowl & only then read that I needed to use extra flour to make the dough firmer (dough was soft). But since I had already put it into the oiled bowl, I just let it be. Secondly, when I put them in the hot water, they did not sink. I’m assuming this was because I used too much yeast. I used 20gms of fresh yeast. I could not find exact conversions online for dry yeast to fresh yeast, & this was the closest I found. I want to try it again this weekend with less yeast & more flour. When rolling, my dough was not smooth. It was not “closing up” (if that makes sense), so had deep lines in the dough after they were rolled. They did not form a smooth ball. The taste was about 70% of a real bagel, so was quite excited by that. Need to try again. Do you have any other tips/suggestions? Thank you. Just made a batch of the bagels and they were awesome! Crunchy on the outside and chewy on the inside. This will definitely be a recipe that I will make often. Thank you so much for sharing the recipe with us. Hi Morgan- From your explanation, it seems that you might have not let the dough rise long enough, or you let it rise too much. Just got some of these in the oven now! Well, they come out and they taste amazing! I, for one, will never buy bagels again! I’ve found the best place to rise doughs (I make lots of pizza!) is to stick your bowl on top of the fridge. You get the warm air from the compressor as it cycles on and off. I woke up this morning wanting bagels, and instead of heading to my local Noah’s, which has taken a significant portion of my paycheck over the past few months, I decided to make my own. Pretty much as soon as they came out of the oven, I had to try them. I made everything bagels, with caraway seeds, poppy seeds, sesame seeds, fresh minced garlic and onion, and some freshly ground sea salt on top. They were phenomenal!! I made a batch for the coming week’s breakfasts, and hopefully I can restrain myself so they actually last that long, instead of eating them all today. Thanks for a great recipe!! I am trying these for the first time. I am wondering if I can substitute with 1/2 whole wheat flour and does it matter if the first part of the recipe is done in a bread machine. I made these this morning and my boyfriend and I have successfully eaten all of them. They were the most delicious and perfect bagels I have ever had! Thank you for sharing this simple but amazing recipe! Love this recipe!!!!! 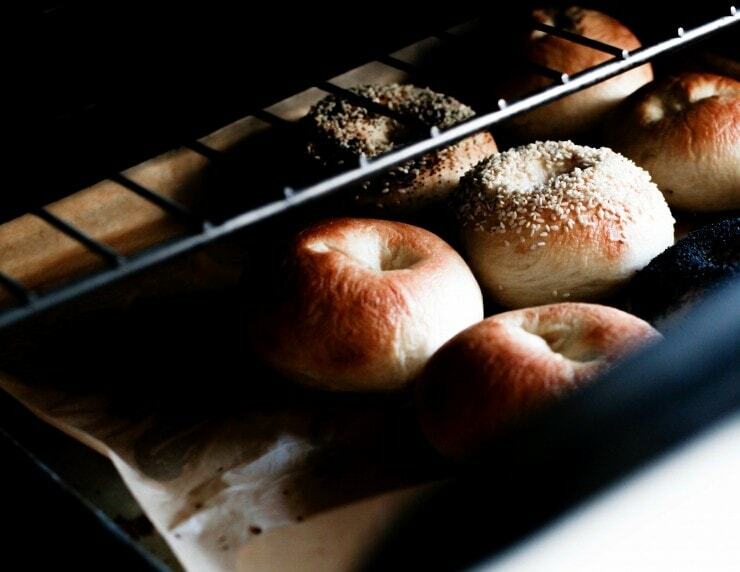 Like others who have lived on the east coast, you never lose that craving for the perfect bagel. This is it. Used my Kitchen Aid on speed 2 for the full 10 minute knead. Was able to work in extra flour with no exertion :) Worked beautifully. We live in the “sticks” of South Dakota where fresh bagels are nonexistant! I’ll be making these on a regular basis. Thanks again for sharing this recipe! I tried this recipe today, and they were delish. Thank you very much for sharing this recipe. It’s definitely a keeper! Already planning to make more bagels soon. Have also shared your recipe link with like-minded friends. My three daughters and I made this recipe and the bagels were excellent. We tripled the recipe and used spelt flour mixed with all purpose flour because we couldn’t find organic bread flour where we live. We homeschool and have baking days every Friday. We will be making a big batch of these bagels every Friday! Thank you! These bagels are first thing I’ve ever baked in my LIFE that came out stellar, and I claim no part of that- this recipe is wonderful and wonderfully forgiving- which is really important to me personally. My family, a picky group of eaters aged 7 to 70, loved them as well and were so impressed! They looked a little pale after 20 minutes of baking so I broiled them for 1 minute and viola! gorgeous golden color on the top. Thank you so so so so much for sharing this recipe. I’m already on my third batch and I am gonna make these forever. My dough didn’t rise at all. Tried the recipe twice Christmas morning. I’m so disappointed! I ruined Christmas breakfast :( Any suggestions on why these didn’t rise? Sally, I truly apologize that your Christmas breakfast was ruined. There are many reasons for this. I suspect that the yeast you used was either expired, or you killed it by adding water that might have been too hot. Because I wasn’t in the kitchen with you, and you didn’t share the details of your process, I can’t tell you what exactly happened, but I suspect the yeast was either bad/killed. Or your kitchen was a bit too cold. Dough will rise in the cold, it’ll just take longer… Ideally, however, you should rise the dough in a warm environment. Feel free to email me what your process was, and what you may have been confused about in the recipe, and I’ll be happy to try and figure out why your bagel dough didn’t turn out the way it should have. Hi Sally- the water, ideally, should be between 100ºF and 115ºF. I’d make sure of a few things… That you’re not substituting anything in the recipe. That you’re using active dry yeast (dry active yeast), that you’re actually putting sugar with the yeast (no sugar substitutes), and not salt- salt will kill the yeast if you’re using that instead of the sugar. Also, depending on the weather, it could take anywhere between 1 hour to 2 hours at room temperature for your dough to rise. I like to mark the container / bowl I’m using with a rubber band / a piece of masking tape to show where I start off at and where I should end up… If you don’t see that the dough is rising, the yeast is either dead, or it’s freezing in your home (which I don’t think is the problem here; you’re in Florida…). If your house is a bit chilly, I’d do this- in a large mug, boil some water in your microwave, and stick the bowl of dough in there (with the mug still inside the microwave). It’ll create a pretty good environment for the dough to rise in. In the other comments, commenters have offered other ways that they rise their dough (I’d read through them and use one that you feel might be right). I can’t imagine what’s not allowing your dough to rise, but I hope one of the tips I’ve mentioned helps. If not, please do tell me everything you did while making the recipe, and I’ll try to figure it all out from there. All the best! So, I followed the recipe exactly and they came out great. I opted for the 2 min boiling either side as think the slight chewyness is part of the bagel charm!.. Have just sliced a bagel in half and lightly toasted it and then had butter and marmite! yummm…. It worked this time!!! I think I had the water too hot. I have 4 cheese and 4 cranberry bagels in the oven. Can’t wait to eat one!!! Bagels! I’ve just made this recipe and the result was awesome. I’ve been living in the Netherlands for 5 years now and I’ve never had a ‘real’ bagel here until now. One baking issue…I greased the cooking sheet like in the recipe but they stuck like mad to the pan. Maybe next time I’ll try with cornmeal/polenta on the sheet instead of oil. Otherwise they were as good as any NY bagel I’ve had! Any adjustments needed at 4800 ft in elevation? I made some and they were really good tasting but I couldn’t develop the crusty and shiny outside. They seemed to not be wanting the 2 minutes in the kettle, I also added barly malt to the pot for the shine. What’s your suggestions? Cut down yeast? Lower proof time? I’d definitely cut down on the proof time. Instead of doubling the dough in size, I’d let it rise 1/3 the size… I hope that helps! Would only using all purpose flour work? It’s all I can seem to find. Thanks in advance for the help. Im making these right now, I can already tell they are going to be awesome! Thanks! Happily these are the real thing as we moved from NY, albeit upstate, to central Michigan and real bagels are here unknown. In the major local grocery when I asked the whereabouts of lox I heard, “Do you mean leeks ?”, “No lox, thin slices of smoked salmon”. Finally found them but had to ask 3 different clerks. Made the bagels using Con-Agra Kyrol premium high gluten bread flour in my high powered 12 cup Cuisinart FP using the plastic dough blade. The FP works very well to produce extremely elastic dough with the added benefit that the mechanical energy from the 1000w motor warms the dough substantially. Really churned the dough until like taffy and could stretch it into a thin balloon like layer. A method unheard of in most bread cookbooks but one I learned from my good friend who makes the best European Artisan breads on Park Ave. in Rochester NY. Cut the yeast back to 1 tsp on my second batch as I prefer less of the yeasty bread like flavor that I found in the first batch. Did slow down the rise so I doubled the time. Got rid of the yeasty taste. Completely deflate the dough before rolling into balls to form the rounds. Otherwise the bagels are not correctly dense and loose some of their authentic texture. Easy to make and truly NYC style. Do you have any advice on which steps you could do the night before? I did everything up to shaping the bagels, I then put them in the fridge on the tray. A few hours later I checked on them and they had swelled and closed up their holes, so were in danger of overproofing (maybe my fridge isn’t cold enough to retard them). I was hoping to do as much as possible the night before and just do the boiling and baking the next morning, but maybe it’s not possible? For those of you who also had problems with sticking, try setting the just-boiled bagels on a wire rack or a plate to drain off any extra water before putting them on the cooking sheet. Also, instead of oiling the cooking sheet, try a thin layer of polenta or cornmeal. I just made these for the second time this way and they didn’t stick at all. Reminded me of the sitzel bagels my grandmother used to bring for Sunday morning brunch. Was never fond of bagels, but this one sound delicious! Hey! I saw these and thought they looked sooooo good! I love bagels, and right now I am doing exam week at my college~ And I NEED these. But when I made them, the bagels didn’t float like they were supposed to…I didn’t use high gluten flour, just plain normal…Could this have effected that? Thanks! Hi Hannah- I suspect your problem was just that the dough hadn’t risen enough. Sometimes, depending on the temperature of the kitchen, etc. the dough might take a little longer to double… What I like to do is mark the container / bowl I’m using with a rubber band / a piece of masking tape to show where I start off at and where I should end up… That way, you know the dough has risen properly, and won’t sink when you get to boiling the bagels. I used to make bagels years ago when I worked as a baker. I no longer have that delicious recipe, but it was a commercial quantity and in Imperial units. I’m dying to try your recipe, but have always believed that authentic bagels use malt syrup instead of sugar. Do you have any idea what the substitution amount would be? Thanks! Hi there! I’m an expat living in Australia and dying to try your recipe! Thank you very much. Another expat living in Australia, this is my second time making these bagels and my family LOVES them! I’m kind of a health nut and always trying to find good food for my kids so this time I made a double batch using wholemeal (whole wheat) flour and wholemeal spelt flour- equal parts of both and used coconut sugar with pink himilian rock salt and topped half of them with black and white sesame seeds and the other half with a Pura Veda blend from the health food store. Super yummy and great to pack into my kids school lunches! Thanks for the amazing recipe!! Eight is not Enough – Thanks for this recipe, living in Italy, my children are loving all the bread, but missing bagels (Montreal Style from Canada), so we were so excited to give this recipe a go, to great success, they have barely been out of the oven an hour and there are only 3 left! Just made these and they were outstanding! No more buying bagels! Fantasic & authentic! Thanks so much. We here in Portugal don’t have bagel bakers, but many bagel fans. Absolutely loved the recipe – easy and quick. I used whole grain flour and the bagels were light nonetheless! My friends and family thank you, too! After reading all the fantastic reviews, I can’t wait to try it myself. I’m from Kuala Lumpur, Malaysia. I was in the U.S. (Providence) for my degree and bagels were my staple breakfast – quick and yummy! I can imagine the crunchy sides and soft centres biting into it…thanks! hi! I´m from argentina and I was looking for a beigel receipe and I found yours! It has so many good reviews that I´m going to try it, tomorrow! promise that I´ll tell you how delicious they were! cheers! These turned out beautifully! They tasted fantastic and were elastic and fluffy on the inside. My only trouble was with getting the bagels to look smooth and perfect, they tended to have a cracked look when I was forming them, maybe I used too much flour for dusting. Either way, they came out looking nice, very rustic! Just faboulous!! Thank you for the recipe and all the other instructions!! I just finished making them and I’m having one as I type this. I followed all the steps just as you had them but I did get creative with the toppings – I put garlic and cheddard on top. I will need to work on perfecting the shape so I’ll definitely be making this again!!Thanks! Oh my goodness, I just made these and look like a bunch of ugly little buggers, but they taste absolutely incredible. I added in about 2 tsp ground cinnamon, 1 tsp of granulated sugar, and about 2/3 c of sultana raisins. Ate one hot out of the oven with just a little bit of butter. Mmm. I have a second batch of dough rising right now, made with some whole wheat flour and chopped rosemary, likely to be topped with some grated cheddar cheese partially through the baking. Thank you so much for this recipe, I’m really excited to experiment with it some more! After reading the recipe and realizing I could probably make these I decided to go for it. The dough is almost done resting and I’m super excited. I haven’t had a good, fresh bagel in a long time. Grocery store bagels just don’t cut it. Thanks for this recipe!! The 20/30somethings group at my church made these during their weekly ‘learn how to cook from scratch’ worship gathering but I wasn’t able to join them because of work…I tried making them at home today but I couldn’t get the dough to a point where it was “smooth and elastic” (step 4) I kneaded in a lot of flour and it was definitly firm, and I’d say elastic, but not smooth…any thoughts on how I screwed up? Your bagel recipe looks wonderful and I’d love to try it. But I only have the quick-rise instant yeast in the house. Can I use this? or do I need to by the traditional kind? Found this recipe, and love it. I’ve got a double batch in the works right now. The taste is terrific, they rise well. Thank you! I made these with whole spelt flour and they are fantastic! Thank you so much! I haven’t had bagels in years and thought I’d never be able to make them myself to suit my allergies bit this recipe is easy to adjust! I made these today and we all agreed that they are the best we’ve ever had. I have only made bagels once before in my life, but have no desire to buy them again after tasting these. Thank you very much! I used regular unbleached white flour and used a Tablespoon of yeast. To half of the dough I added soaked raisins and cinnamon just before forming into balls. After the boiling stage I put the bagels on a rack to drain a bit. I just gently rubbed a little olive oil on the plain bagels before adding sesame seeds to the top. That worked great. To the cinnamon-raisin bagels I didn’t use a wash or oil – I just sprinkled on a cinnamon sugar mix. I always oil my cookie sheet before sprinkling cornmeal or polentia on it. It always tastes great and never sticks. I do the same thing when I make that 5 minute artesian bread found on youtube. I want to add that I started the recipe differently than you did, while using the same ingredients. I am 60 and have baked bread for years. You don’t need those extra steps unless you have some reason to mistrust the yeast. I also always keep my yeast in the freezer until I use it. If you have made bread before, it is normally not difficult to knead by hand, but this WAS more difficult. I’m sure that is what you must accomplish in order for this to be successful. I just made your bagels – have never made bagels before, and generally hate baking with yeast. OMG they came out well! And it wasn’t hard at all, I procrastinated quite a bit before attempting the shaping and boiling, but it didn’t seem the dough got any worse off. With some Parma ham, Parmesan, lettuce and a mixture of olive oil and maple syrup – I’ll always have bagels in my freezer from now on! Thanks for this recipe. These bagels are the best I’ve ever tasted. I can’t believe I ever liked shop-bought bagels! THANK YOU THANK YOU THANK YOU!! A million times over.. I thank you. Four weeks ago I stumbled upon a recipe for bread machine bagels posted on allrecipes.com. I always wanted to make my own bagels but was too scared. It seemed so easy but after 3 consecutive failures in weekend baking I decided I should try it by hand before I call it quits. I’ve never made a bread dough by hand (aside from my Irish soda bread but that doesn’t have yeast.. Big deal) I got a bread machine because I thought it was too complicated.. You’ve now shown me how wrong I was. Theses bagels came out perfect! Absolutely perfect! And coming from someone who grew up and still lives in Bergen county NJ (we take our bagels even more seriously than NYC) it means a alot. They were crunchy on the outside and just the right amount of dense and chewy inside. I just hope my boyfriend doesn’t get too upset when he finds out the bread machine he got me for Christmas isn’t getting as much use. Ohh! I meant to ask! How would you go about tweaking the recipe for cinnamon raisin bagels? Expat from DC, living in the Kingdom of Tonga. Couldn’t sleep, it’s 6am and impatiently waiting for my dough to rise. Seriously very excited. I used wholemeal flour – and a pinch of garlic powder, but otherwise it’s all you. OMG! I loved these. Totally amazing, I don’t think I will buy bagels again. I also think it is the first thing I have baked properly! I was so proud:) Great recipe:) I used black sesame seeds, garlic and Onion Flakes and Salt. Yum. I also added a single yolk to one batch and that was super great as well. Thank you for your recipe, I made some great bagels very delicious, however I couldn’t make the shape like your ones which are very smoothly, very round, Could you please to tell me how can I do it? Many thanks. Mine shaped better when the nicely shaped dough balls were allowed to rest long enough for the dough to relax and then they stretched easily. After they raised a bit and I put them in the water, the one’s I crowded into one pot did not shape well, but the pot where I just boiled one at a time turned out perfect! You get better at shaping them with a little practice! I am a Canadian living in Argentina and you can’t get much of anything here. Every once in a while Philadelphia Cream Cheese shows up in the central market…not grocery stores for some reason. I have two salmon and a chive and garlic in the fridge…and was craving bagels. So…the dough is rising…and we’ll see soon how they turn out. Never do trust the ingreients I get here. Yesterday I made butter tarts…a Canadian favourite. People here say I should open a bakery because the baked goods here leave a lot to be desired. Hell…most of them have never had a real apple pie!!! Will let you know how they are. Oh my gawd…fabulous. There are only four left. Fifteen minutes out of the oven. Can the recipe be doubled?? Eight is definitely not enough. I do not get the instruction about how to make the balls of dough perfectly round. Mine are pretty messy looking I can’t get the creases out and the more I try the worse it gets. Haven’t finished the process yet so I don’t know if they taste yummy yet, or not. hmmmm… ok, me again. I had trouble with a few things so I think I’m going to need to attempt another batch. I really found it hard to make perfect round balls, so the bagels were pretty messy. I also found when I baked them after the boiling step that they really stuck on to the baking tray even though I’d oiled. Any handy hints you have for improving my rolling skills would be eagerly attempted. They were yummy but I think I overcooked them a little and so they were very very chewy. Still I like them enough to try again. I’m living in a tiny village on the Pacific coast of Panama so all baking is good baking. I’m also trying to get proficient at sour dough bread. Anna…just form them into perfect balls with your hands…I had trouble with the method described…use both hands rather than one when you put them on the counter top…and flatten slowly…mine worked perfect the first time. Make sure you let them rest after rolling the balls. Make sure you boil for one minute only on each side. I did one at a time also….I know what you mean…here in Argentina also…any baking is good…but these bagels really are just perfect. I am wheat intolerant so I made these with spelt flour and oh BOY were they good!! I thought my bagel days were over but these have completely changed that! These are the first wheat free bagels I’ve ever had that are not disgusting. These are outstanding!! They will definitely become a staple in my household. I’m a South African and I lived in Florida USA for a few months in 2011, and instantly fell in love with Brooklyn Water Bagel’s bagels. In SA we don’t have bagels & the majority of people here don’t even know what a bagel is (which is a shame).. So I’ve been looking for a great bagel recipe and I haven’t tried this one yet but I am about to.. I like the fact that its a “one day bagel” recipe, I’m an impatient baker plus most of my baking efforts en up in the trash.. (I’m young and still learning). This is a great blog :) keep up the great work. Now I know where I’ll be getting all my great American recipes from. This recipe looks great, but do I need to make any adjustments if I use wheat and gluten free flour (I am allergic to wheat and gluten)? Hi Kim, I suspect you will have to make many adjustments when using gluten-free flours to make this recipe. Because I’ve not attempted gluten-free bagels, I cannot give you much advice, however, I’ve done a bit of research for you, and I suspect that this recipe: http://www.food.com/recipe/gluten-free-bagels-255600 might be a good place to start. I never thought I’d be able to make bagels, and this recipe just proved me so wrong! I used half whole-wheat flour and half unbleached all-purpose flour, boiled them for about a minute and a half each side, and topped them with sesame seeds and garlic. Lightly crusty on the outside, fluffy and chewy on the inside. Perfect! This was also my first time making dough balls; I found that using my hands as opposed to a countertop worked much better for me, and while the resulting doughnuts weren’t perfectly smooth (they got a little lumpy when I boiled them; not sure why), they were still nice and ring-shaped. Thank you thank you THANK you, Kamran, for this recipe! Thanks again for this awesome recipe! Hi, I’m from Argentina and miss being able to find nice tasty bagels a lot, have tried making some other recipies I found on different internet sites but I could not get the right shape and texture yet. I will try yours and will let you know how it goes, if they come out as everyone here says I might try selling them to the expats who live in Buenos Aires! Finishing baking my first batch right now. Will follow the suggestion given above about using cornmeal after oiling. A few of mine are sticking. But they look and smell heavenly. I made 3 plain, 3 italian (sundried tomatoes, basil, and provolone topped with provolone, parmesean and italian spices) and 2 cinnamon chip. Can’t wait to try them!! i just made these and i was so amazed!!! i used all purpose flour and they tasted great. took the dough forever to rise in this new england weather, so i stuck it in the oven during the process after letting the oven preheat for a few mins then turning it off so it didnt get very hot just warm. i did not get the dough smooth and there were ridges and cracks in my dough balls that were impossible to get rid of. the result was a bagel that was a bit bumpy on the top instead of smooth but cosmetically wasnt a huge difference. I will DOUBLE the recipe next time for me i only made 8 very little mini bagels. i used butter before baking to keep the toppings on. i used cinnamon and sea salt. 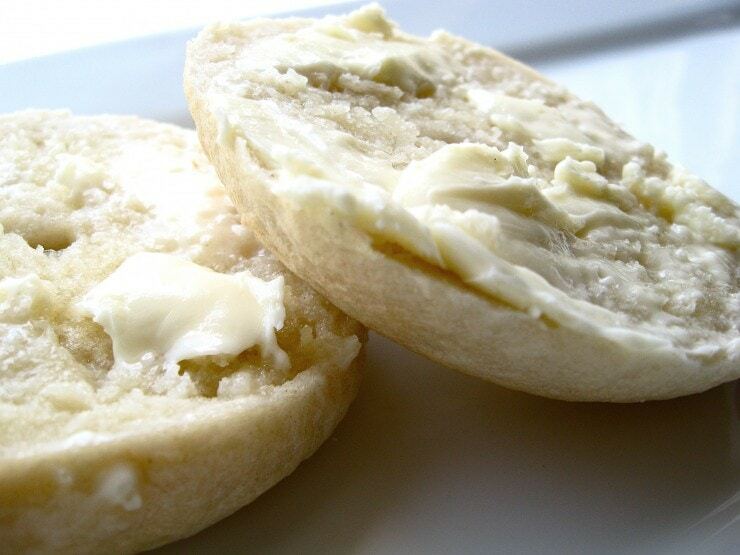 PS salted bagels is a regional thing but if youve never had it…. OMG YUM!! my most fav food love the recipe i will pass on!!! After searching for the perfect recipe, I’m finally attempting bagels at home. I’m also from Buenos Aires, and bagels aren’t easy to find here. My first batch is in the oven, I’m keeping my fingers crossed! Thanks for this recipe! These bagels are AMAZING, I love them! I’ve lived in Australia for five years and have been bagel-less, until now! I am thinking about making both blueberry bagels and cinnamon raisin bagels, and I am wondering what your suggestions might be to do this. I have read other recipes regarding blueberry bagels and have read a mixture of suggestions: fresh, frozen, dried or a mix of all three. I was thinking about taking this recipe and dividing the dough before I let it set for an hour, kneading in the ingredients and making two flavored batches (or just four plain and four flavored). Anyways since this recipe was such a success I would love to hear your suggestions/ratios on flavoring. Thanks so much! Greeting from Shanghai China. I made bagel this afternoon. Feel great! Thank you! Ahh thank you for this recipe, it turned out absolutely great for me!! have you tried a simpler method; cusinart with metal blade for 45 seconds (read Charlie Van Over’s Best Bread Ever, out of print but worth stealing) simply recipe: rapid rise yeast, bread flour 14% protein, salt, barley malt. shape them retard in fridge, boil and bake in 24 hours. Cannot miss. I live across the street from Zabars and the former H&H in NYC and have not ever bought one of theirs. Have been making them flawlessly for seven years. I have made this recipe a lot and I almost always double it. It works perfectly! Everyone I make this recipe for insists on the recipe and I link them directly to here. I would imagine that Kamran has had a distinct increase in readership for this recipe alone! Some day I will attempt another recipe from here! I live in Australia and the nearest bagel shop to me is literally 1800kms away… just wondering if the oven temperature (220celcius) is fan forced or no fan? My oven has no option to turn off the fan. i will try your recipe the next time i make bagels—question—when baking, do you flip the bagel or just put them in and cook? mix your dough in 45 seconds. Perfect results. Oh my. Mine are in the oven right now! I can’t wait until they are out. I chose a topping of toasted sesame and coarse salt. CAN’T WAIT! Time to use up my half bag of bread flour! Thanks for this awesome recipe! Yes, the secret of traditional bagels, the difference in their texture from store-bought ones, is that the dough is boiled in water first, then baked. However, I had always heard that they are boiled in salt water. Thoughts? Comments? Made these bagels the other day, came out great. I have one question. I was leary to place the bagels in a plastic bag to keep them fresh and soft because of the yeast. I thought I’d have mold on them the next day….. so I didn’t put them in a plastic bag. They were as hard as a rock the next day. Traditioning, how long can you keep a bagel fresh ( soft). I guess I should of kept them in a plastic bag. They were great right out of the oven. but I’m used to them being softer for at least 5 days. ?????????????????? Added tsp cinamon too fantastic taste. These are awesome! It was my first-ever attempt at making bagels, and they were perfect! Thanks a ton for the most perfect recipe ever. I made the best tasting food ever at home, stuck to your recipe all the way! In fact, I am going to use your recipe to make all kinds of bread from now on. 2. Baking paper stuck to the bottom of the bagels even though I had greased it. For the second batch I put them straight on the quartz grill rack, instead of the baking paper in between. 3. I think I could have done with a little more salt. 4. I replaced sesame with oregano and chilli flakes for 1 of the bagels and it tasted amazing too! I have a question: why do we need to boil the bagel? How does that help? Today I made a very successful batch for the second time ever. I’ve never liked bagels till now…..I obviously have never had the real deal before! I don’t use oil to grease the tray with any of my bread. I dust the dough and bowl with flour for the first rise and then when baking I dust the non-stick baking tray with ample flour. Also when making the hole I pushed my finger through to the benchtop and then gently twirled the dough round and round a few times keeping my finger on the bench, just like a hula-hoop. If spinning works for pizza dough then I thought it might work for bagels! It made a nice round hole and evenly distributed the dough. I presume by par-boiling first the moisture is sealed in by the cooked outer layer??? Just took them out of the oven! Its Sunday afternoon, cold and raining cats and dogs outside, and we’re inside all toasty warm and eating hot yummy bagels. Life doesn’t get better!!! I’m a bagel enthusiast and connoisseur; these bagels are awesome! I had to try one piping hot straight from the oven – one turned into 3. My only gripe was that the outside crust didn’t come out as smooth looking as yours did, there are tiny indentations all over it. Any suggestions? I made these bagels because I am now living in Australia and can’t get them anywhere!! I have never made bread or anything of the sort, but this recipe was so easy and made the BEST bagels!! I am now making jalapeno cheese bagels and all the ones I miss from home!! I have orders already from friends who used to live in the US!! Thank you sooo much for bringing home a little closer!! Hi, I love bagels and would love to bake some using this recipe but I can only find instant yeast here. Can I substitute active dry yeast with instant yeast? If yes, do I use the same quantity and follow the same steps? Jessica…I have made these several times using instant yeast. Live in Argentina and its the only kind I can find. They sell it for making pizza here…”Argentinians are Italians who speak Spanish and think they are English”. LOL. Ok, I’ve never posted feedback for a recipe before….. But never having experienced a “real bagel” I had to try this. I am blown away. It’s amazing what you can find on the intraweb… followed it exactly, and it was easy. (took me a bit to get used to forming them) Like all other poster….3 gone and I wasn’t even hungry. Will never buy again. Thanks a bunch. Hi Kam! I’m Weiya and I blog over at Enjoyer of Grace. Thanks so much for sharing this delicious and easy recipe. Our family LOVES bagels and I never knew that they were this easy to make. I’ll be sharing this recipe with my readers this week. Thanks again! Thanks for the recipe! It is so much simpler making bagels then I thought it would be! I tried them this weekend and they turned out great! I didn’t have any bread flour, so I just used All-purpose flour, and they still turned out delicious! I made different variations with poppy seeds, everything bagel seasoning, garlic, and of course plain! I wasn’t sure how long they would keep, so I brought them into work with me and they were a huge hit! Thanks again! Use a whiskey glass to make the bagel hole instead of your finger. You will get a neater looking bagel. Made these for the first time today… great recipe. Thank you! My little boy is enjoying one with pumpkin spice cream cheese right now. Perfect fall treat! Can I substitute regular flour? Fantastic recipe! I’m an Aussie bagel lover and decided to give these a go tonight. Trying to stop myself from eating them all before tomorrow! We live in Cape Town, South Africa and really struggle to find good NY-style bagels here. I tried making bagels for the first time today using this recipe and now our search is over! Thanks for a great recipe. I want to know if if you have the recipe with fresh yeast insted of dry yeast. Since the reaction is diferent, its not the same amount. Also I want to know if the sugar whould be less, since its normaly used along with dry yeast to help activate it. The BEST bagels ever and bonus they are so easy to make!! Thank you for sharing this amazing recipe! Just made these today…thanks for the wonderful recipe! We have recently moved south of the Mason-Dixon line from NY and miss good bagels. With a little tweaking, I am sure these will be a great substitute…thanks again! Thank you for the recipe. I made them today and the came out delicious. Having basically resolving to simply stop eating bagels at all from being disappointed by store-bought soo darn often I went on a mission today to finally just make my own. These came out amazing!! I made two batches, topped some with garlic and onion and some with sea salt, both were outstanding. Complimented these with the homemade veggie flavored cream cheese that I’ve been making for years and… Mmmm. Heaven! I am actually a rocket scientist (well, astrophysics, that’s near enough) and always make my own bread too – I still have doughy hands from having just made some! Never tried making bagels. I live in an agricultural area of the UK and there aren’t any bagel shops at all, so I’ll be using your recipe and seeing what I get. Mazel tov! Wow, this is a wonderful recipe–a gift that keeps on giving to all of us bagel-deprived persons around the world. To underline many of the comments above, this is the best recipe I have found that comes closest to the real deal. The tip about leaving the bagels to boil a bit longer to produce a chewier bagel is greatly appreciated. Merci beaucoup from France. Hi Kamran, greetings from Costa Rica! I have to thank you for this recipe, I love bagels, but the fact is that here we have bagels store, but they aren’t good enough, so I’ve been searching for some recipes, and actually this became in my favorite! Pretty easy to make, and delicious too! So, thank you again, for real, your recipe is now one of my favorites! I made these bagels are very good but I couldn’t get them brown very good on top. The bottom browned and was quite crusty think it was because of the oil from the pan. What do I need to do? This is my first time making bagels and I decided to use your recipe, they turned out absolutely perfect, thanks so much for the recipe! It’s my first time making bagels with your recipe and it turned out very good. Thanks! I just cannot wait to make this recipe. Reading through all your comments I am so totally impressed with the positive mass reaction. Nice to know that around the world we are all sharing this fabulous recipe. I love fresh cinnamon sugar bagels…you know the ones with the cin sugar crust? Does anyone know how to achieve the crust? We can’t wait to make these! Any suggestions about how to get toppings to stick without the egg wash? One of my daughters and I are allergic to eggs. Thanks! These are ammmmazing. I’m a East Coaster living in Iowa for vet school and I crave the comforts of a good bagel. THANK YOU! For a blueberry twist add 3/4cup dried blueberries… even better. Awesome recipe. I have found it better to let the dough rise for 10-15 minutes so that the bagels retain their shape after they are shaped into balls. But if you insist on waiting the hour out (which hardly anyone would prefer) you should make the bagels a lot smaller. For instance, if you were going to follow this recipe and let the dough rise for an hour make 11-12 bagels instead of 8. My roommate and I were missing bagels as we are abroad, this was such a nice treat! Great recipe! I just finished my first batch and can’t wait to try them. In the meantime, one issue that I had is that they flattened out a lot during the boiling process. Before they went in the water, they were perfect size, smooth. After the boiling, they were very lumpy and much more flat (never puffed back up after baking). Any ideas what might have went wrong? Hi Mara- It seems like you didn’t let your bagel dough rise long enough… Once they were in the water, did they float to the top at all, or did they stay at the bottom of the pot? I’m super excited to try these out as you can’t get good bagels where I live. However, I can only get my hands on “instant yeast”- is this the same as active dry yeast? If not, do you know how to convert between them? Thanks! Woohoo! I just made bagels via your recipe – I was a little worried how they would turn out as I only had plain flour, and it is a super hot and humid night here in Brisbane, Australia… While they aren’t as pretty as yours, they taste fantastic! I am channelling NYC sitting here with a Starbucks Christmas Blend ready-brew and a warm bagel with cream cheese! Thanks so much for the recipe – I love it! Hi Pamela- You can simply substitute it for the bread flour entirely, or you can do half white whole wheat flour and half all-purpose flour. The recipe is pretty flexible! Really good bagels..never made bagels before..I bake bread often..can’t wait to get up in the morning and have another!!!!!!! Thanks so much!!!!! Can I use instant rise yeast instead of active dry yeast? And if so should I skip the first step of proofing the yeast in water or should I still do that step? First of all this is the second time i am making these and they are amazing!! and might i say even better than i have ever tasted. The supermarket one’s are HORRIBLE!!! The first time i made them i didn’t have any doubt in my mind they wouldn’t come out right and they did!! Therefore your recipe will be murderlize (i know that isn’t a wrd ;D) throughout the year from me. Thank you for this recipe. Best wishes from Kingston, Jamaica. My friend and I made these and they are so amazing I wish we’d doubled the recipe! My family was fighting for them. We have plenty of bagel places but we wanted to make them for fun and they turned out great, they are fool proof. The only change we made was adding a cup of honey to the water when boiling, not sure if it made a huge difference because this was the first and only time I’ve made bagels, but a different recipe said it made them chewier. We also made sixteen mini bagels instead of 8 big ones. Thanks so much for the recipe and instructions! Thank you! I Live in Kathmandu And we were missing to have a bagel at breakfast. This recipe is fantastic! In the process of baking them now and cant wait! I doubled the recipe and did blueberries in half. First batch is about to come out as we..uh?…type. Wait for it…….WOW!!! not as dense as I am use to, but way tastier then I was anticipating! I will certainly be switching out my bagel recipe! Thanks for sharing! Can I substitute egg replacer instead of eggs for egg wash because I am a vegetarian and also can I make the dough in the bread machine? Well, I have to give it to you, these are by far the best bagels I’ve had in a long time and my “bagel-loving” friends agree with me! I live in Spain and it is not easy to come by fresh bagels here unless you make them yourself. I made 3 batches this weekend and received nothing but praise, so THANKS A MILLION FOR SHARING! Two questions I have that I forgot to ask in my previous comment. Is this the kind of dough that can be made ahead and baked the following day? In other words, can you make a batch of dough, refrigerate it and then do the rising, proofing, boiling, etc. the following day? Also, if you make a good number of these bagels to keep, I assume they should be frozen right away. Is this correct? Again, thanks a bunch for sharing this and your tips. These are scrumptious! I was very nervous to make these for the first time but they turned out great. I was wondering though if this recipe can easily be doubled? In NZ, you cannot get a proper bagel. I’m a fourteen year old American living in NZ who loves to bake. After seeing a gorgeous bagel sandwich in a small town cafe, I couldn’t stop craving them. I found your recipe and decided to try it. I followed the recipe except with a slight modification – I used about 1 1/3 cups of oat flour and used a mix of all purpose and high grade flour for the rest. They came out heveanly! Next time I think put the dough in the fridge overnight and put an egg wash on it even without the seeds – also I’ll experiment with different amounts of Oat flour. My attempt didn’t turn out that well. Rolling them into balls was tough and there were always bits that wouldn’t merge with the rest of the ball. They didn’t sink when placed in water. The resulting bagel was rather dry with a dry weak crust. I’m guessing my problem is the amount of flour and water needed to get the ambiguous rating of a “moist and firm” or “firm and stiff” dough. Wow..since retiring and moving to North Carolina, I have not been able to find a decent NY style bagel. After checking all the recipes and did not want to wait for the “sponge” method, _I decided to try your recipe. Since I retired,I have been baking more homemade goods so when I got the craving for bagels I decided to give it a try. They came out perfect. The only tweek I did was add some honey to the boiling water to give them a subtle sweetness. They are great and I don’t have to look any further. I was going to try freezing some but they aren’t going to make it that far! Thanks!! These are amazing! Thank you so much! I made them into cinnamon and raisin (sp?) by adding 1.5 tbsp of cinnamon with the flour, and 3 tbsp of washed raisins at the punching down stage. I didn’t want to add the raisins too early as I was worried the sugars and natural yeasts may effect the rise. I also used my kenwood to knead with the dough hook, let it go for about 8 minutes, I may let it go for a bit longer next time. They are superb, I split and froze them after eating one warm from the oven, and the frozen ones are still excellent toasted. I will never buy a bagel from the supermarket again! Just made these bagels, waiting for them to come out of the oven! I brushed them with an egg wash and then coated them with a mix of cinnamon and sugar! YUM! I was browsing the net for a great bagel recipe when l came across this one. Reading through the comments l knew had found a great one. As an expat from England living in Senegal found it a bit of a challenge getting white bread flour, so l called around to friends and l got 1kg of un bleached white flour. Gosh l enjoyed them so much, at the moment am making the second batch. Have never had a bagel as good as these ones thank you so much for the recipe. Thank you so much for this recipe! I have looked at a zillion on the net. This one is so easy and good. I made two batches today. One regular, one garlic and onion. I sauteed half cup minced onion and 2 cloves garlic, and added it to the larger portion of water when it was added. They came out great! I am having fun experimenting. Thank you!!! Thank you so much for this recipe – Ive had mixed success in the past trying to make bagels but these turned out fantastically well – havent seen anything like them here in Sydney and they were a bit hit with my friends at brunch today! Thank you, thank you, thank you!!! This was a great recipe. Today was the first time (of many future times) that I made these bagels, and despite being not as smooth and beautiful as yours, they tasted great! I’m an American living in Berlin, and although the Germans boast about their good bread, there is nothing like a bagel. Needless to say, I’m very grateful for this easy tasty recipe! My boyfriend is Spanish and he had never eaten a bagel before, but I made him these and he loved it! Thanks again for your great recipe!!! (Also, I have to say your website is very well done! Great job on the writing style, photography, and recipes!) By the way, how do you get your bagel balls so smooth (step 6)? I’m thinking maybe my dough was too dry and that is why they didn’t smooth over so well? WOW! These were so easy and so tasty! I am an American living in Eastern Europe where we have rye bread coming out of our ears, but nary a bagel to be found. One of the other expat women and I made your recipe this weekend and are THRILLED to have a taste of home that we can easily whip up on a Saturday afternoon. Thanks for sharing. I just made a double batch of these bagels and didn’t change a thing (which is amazing for me). I had to eat one right away and it was wonderful! I have made bagels through the years but this recipe is the ONE! I did add a bit of molasses to the boiling water as I have always done and I also drained the bagels on a rack just after boiling and before placing them on a pan oiled with grapeseed oil. I am very pleased and I thank you and my family be very happy even though they are very bread spoiled. I made these bagels today, although they did require way more than 1/4 cup extra on the water (new york is SO dry right now) they came out absolutely fantastic. I was wondering how much you weigh your bagels to? 87-90g? Seems about the right weight for this recipe. So, I am trying to make these right now. I am doing a cinnamon variation and was not sure of how to incorporate the cinnamon, but then I decided that I would just knead the chips into the dough. I turned my oven on warm prior to beginning these and then turned it off when I started kneading and let it cool with the door open. I did this because we keep it fairly cool in our home (65 degrees). I put the dough in the oven to rise. I have about 20 minutes left though and the dough has almost tripled. I am trying to follow these directions to the tee, so I am going to leave it in there for the full hour because I remember reading that the hour was necessary. I hope these turn out as good as I am imagining them…I am so impatient and like instant gratification so this has been a long hour for me…I will let you know what happens. I decided to make it today. I used the microwave method to keep the dough warm and it rose! I made a cinnamon raisin batch just by eyeing the extra ingredients and made regular and mini bagels. I boiled them for 2 minutes because I wanted that chewy texture and just took them out of the oven. They taste amazing! I wouldn’t recommend boiling the raisins though… but the plain ones are awesome! I’ve made this recipe a couple of times and today I finally got them to look nice and round hehe.. I live in northern Canada where everything costs a pretty penny, now I’ve been able to scratch another item off that I can avoid buying and make myself. I also save a lot of time by throwing everything in the bread machine and letting the machine do the mixing and rising. Thanks for sharing a great recipe! Just made a batch up and they are very tasty! I made it up as directed. Then once the dough had risen, I divided it in half to make two different flavors. The first I did a classic sesame seed. The second half I made cinnamon and raisin. I mixed together 1 tbsp brown sugar, 1 tsp cinnamon and 1/4 c raisins. Flattened the dough out to a rectangle and spread the mixture across the center of the rectangle then folded the sides over, like a letter fold. Flattened it out again and kneaded the dough. I had to fold more flour into this as the brown sugar tends to make the dough too sticky. Once i got the right consistency, I rolled them into bagels as I did with the others. The result was delicious cinnamon swirl bagels. They do tend to be a little trickier to get off the pan so make sure you grease the pan well. They also are a little crispier on the bottom because of the sugar. But very yummy! I was craving bagels late last night but I am determine to stick to my monthly budget goal, which means, no buying bagels until the first of March. I found several other recipes online but none with as much praise as yours! Read the recipe and was shocked at how simple it seemed. I didn’t have bread flour so I used all purpose and kept my fingers crossed. They came out AMAZING. A thin crisp outside and a soft fluffy inside, even my husband, a nay-sayer of bagels, just went through two. Thank you so much for this recipe! I’m a novice baker and I’ve just seemed to have a lot of luck with breads. I was scared it wouldn’t work out but it did! I will definitely never buy bagels from a store ever again when my own are so amazing. I rarely leave comments on recipes but this bagel recipe is mind blowing. Hi, If i would like to make Chocolate Chip Bagel, what would you recommend? can this bagel recipe make a good pretzel or do you have a good pretzel recipe? I just finished making the bagels and they taste great! Next time I’ll use a bit more salt (the salt here in Austria seem to be less salty than elsewhere for some reason). I was wondering though why my bagels don’t get that shiny smooth surface? I really tried to make the “raw” bagels as smooth as I could, but the dough stayed wrinkled and “bumpy”. Was I using too little water in the dough already, did I kneed too long/too short or were they too long in the water? Realize it’s difficult since you weren’t here to see what I did, but maybe it’s a common mistake? Thanks for a great recipe! Thank you very much for the recipe! I’m from Moscow, Russia and I’ve been to NY only once and I fell in love with bagels! Now I can cook them by myself. that’s amazing! Hello from italy!I am waiting for the dough to raise but it isn’t very smooth as I attempted to kneat it myself … unsuccessfully I guess!do you think I can use the bread machine to kneat it for about 60 sec after it raises so that it becomes smooth? Greetings from Sweden! Thanks so much for the recipe =). I haven’t had a bagel in five years and finally not being able to stand it any longer, decided to see if I could make my own and your recipe was perfect =). I did have a few mishaps on this first batch. Can’t find bread flour at all, like many others who don’t live in America, so I had to use regular flour and maybe that made a difference? The bagels did rise, but they didn’t seem to rise enough. It’s like an almost perfect bagel, if that makes sense. After reading the other comments, it might also be the ‘warm place’ to rise dough. It’s quite cold in this frozen place. Maybe I should have turned on the oven and let the dough rise on a low heat in there? Or maybe I didn’t leave them in the oven long enough? Anyway, for a first attempt, I satisfied my craving, but want to try again to address the other issues so I have a perfect bagel recipe =). Thanks again! You are making so many folks who live overseas so happy =). Fantastic recipe! I tried it last weekend and it was a success. Today I’ve doubled it and everybody is waiting for bagels! We recently moved to Chile from the US and haven’t found bread flour. I used regular flour and the bagels were wonderful! It was a lot easier than I thought it would be! I made mine with 2/3 Whole Wheat and 1/3 bread flour. They looked gorgeous and were delicious but a bit cakey inside (what do they call that, small crumb? ), I’m going to try adding some gluten to the mix next time and letting it rise even longer, maybe use a wetter dough too. I was pleasantly surprised how they firmed up after boiling… made them super-easy to handle & transfer individually to a baking stone. I used this recipe yesterday, the bagels tasted amazing. During the kneading stage though my dough was really really sticky, no matter how much flour I put on it. It also lacked consistency and hindered my ability to knead it for the right amount of time. I was wondering if there was anything I could do to rectify this? Would it be okay to use say 25grams of butter to help with the dough? Any thoughts on making honey bagels? I’m a broke college student and don’t have any toppings. I have honey, though…do you think adding a little honey to the dough as well as the boiling water would throw things off at all? I had a craving for bagels yesterday, but was too lazy to stop at the store….good thing!!! I came home and found this recipe and made the bagels last night. I made plain, garlic, and poppy seed. This is the EASIEST and best tasting recipe. Soooo today I decided to make cinnamon raisin…they are still cooking, I will let you know how they turn out. Thanks for posting this great recipe. Absolutely perfect! They were immediately cut in half and topped with bacon and a poached egg. Delicious! I’ve just made this recipe substituting the flour for a gluten-free flour mixture of rice flour, tapioca flour, oat flour and coconut flour, as well as corn starch and xantham gum. I also used gluten free yeast and coconut sugar. Because of the weight of the mixture, I think a 1/2 tsp more yeast next time will be needed. I will also proof the yeast with the sugar in a bowl rather than a measuring cup to ensure that it proofs completely to help with the rising. To echo everyone else, these are great! First time making bagels and it was a breeze. I only had a small pot so the most time intensive part was boiling them one at a time. I also didn’t have any bakers flour so added in a bit of gluten to plain flour and worked fine. Will be doing this again! This is an AWESOME recipe. I’ve made them 1/2 a dozen times now and sprinkled with sesame seeds before baking. I’ve made it with bread flour and used my bread machine on the dough cycle each time and they are marvelously tasty and chewy. The las batch I added 1/4 cup rye flour & 2 tsp caraway seeds. Your recipe was the first I tried and won’t go any further. Both my teenage children LOVED them and the first two batches were gone in 2 days. Thanks for posting such a great recipe! These bagels are amazing! They taste better than a bakery’s bagels. YUM! Wow! I’ve been looking for a really good recipe for the bagels since 1999, since the day me and my family moved away from Montreal. So yesterday I finally took my guts (?) and made them. And this morning I finally ate one! Wow! Soo good! They tasted Montreal! Yum! So thank you! So very much! These were so yummy! I’m on a diet but I ate 2 right out of the oven! (Ok, maybe that’s not so good:) But they are so, so delicious. Thanks a ton. Can’t wait to serve these to my mother-in-law. P.s. did I mention they’re yum?! I had never made bagels, always been more of sweet cook; but these were amazing!!! Making more batches on the weekend. Thank you for such a wonderful recipe! This is a great recipe. We don’t have any access to “real” (boiled) bagels where we live but these are a terrific (and certainly cheaper) solution to our bagel cravings. So far we’ve made plain, onion, cheese, sun-dried tomato, and garlic bagels. The dough is very forgiving, so you can just knead in the extra ingredients before the first rise. For the sun-dried tomato bagels I used the liquid I soaked the tomatoes in to give the bagels a lovely reddish orange color. Same with the cheese bagels, we just knead aged cheese in at the first rise, then top them with a little more shortly before they are done baking. We do let them raise a little longer after shaping but before boiling to get a larger slightly fluffier bagel. I live in a high-altitude city (7,000 ft) – how would you alter the recipe for high-altitude? We prefer to put the flavors IN the bagel rather than just dumping it on top. We’ve made tons of different varieties of bagels using this recipe, but have perhaps just made the BEST bagel ever: bacon and cheddar. Fry the bacon crisp, crumble it up, add it with a whole bunch of cheddar to the dough at the first knead… This recipe is super forgiving and if whatever you add to the dough at the first knead makes the dough too moist, just add a little more flour and knead well on the second knead. Next up: feta and greek oregano, manchego and rosemary. Any other ideas? Here is my bagel recipe: 2 cups bread flour and 1 cup rye flour. 2 teaspoons of yeast and 1 tablespoon of sugar in 1/2 cup warm water. Add 2 cloves of minced garlic and plus more water if needed to get a soft dough. I use a food processor with the dough blade. You will find it is easier to roll it into a ball without creases this way. Use a whiskey shot glass to get a perfectly round hole. I made these the other day and were DELICIOUS. My family ate half of the batch before they were even cool. Definately a keeper. Whoa, pretty good for my first try at this recipe and baking in general. I had to make some last minute substitutions and used King Arthur whole wheat flour, aside from the flour being wrong I still think they came out a bit too dense and wonder if it is because I did not stretch the rings as much as I should have. Any advise? I haven’t read through all comments, but the recipe doesn’t specify baking temperature. Does anyone can suggest? Hi – this is really a wonderful recipe. My kids loved it! I just want to confirm if the dough is really a bit sticky sticky than normal. The bagel turned out right but I just wonder if the sticky dough can be corrected. Thanks! These bagels are SOOOOO AWESOME!!! I lived in a very Jewish community in the Catskills of NY where we had authentic NY Style bagels. I would always come home with at least 2-3 doz (14/bakers doz)and would freeze them. I’ve left that area and my daughter has always brought some with her when she would come to visit. Now she won’t have to be teased during her 6 1/2 hr drive to visit with the aroma of the bagels! I separated my dough and kneaded about two TBS of minced jalapenos into one section and asiago cheese into the other section. My boyfriend and son are SOOOO thrilled to be able to have jalapeno bagels – my next batch will be getting even more jalapenos. I’m looking forward to making more this weekend and experimenting with other flavors!! Thank you so much for sharing this recipe!!! GlasseonWeb,the recipe calls to bake your bagels at 425ºF / 220ºC for 20 minutes or until golden. I make jalapeno cheddar bread all the time – try some cheddar with your recipe! Thanks Vicky! I’ll definitely do that!! I’m going to try to see if I can modify this recipe to make it as a loaf. Any suggestions? I’ll be glad to share my recipe – it’s great! But am not sure if it’s appropriate to post it here. Does anyone know? Kamran, Since you have my email address as well as Vicky’s you can feel free to email her with my address. Vicky, if he does, just put something in the subject line so I’ll know it’s you! 1. Proof yeast in water with 1 teaspoon sugar for 8-10 minutes or until foamy. 2. Heat milk in microwave for about 50 seconds on high. 3. In your mixing bowl add chopped jalapenos, salt, sugar, egg, and warmed milk and one cup flour. 4. When the yeast has proofed, add to the bowl and start kneading using your dough hook and adding in flour to create a soft smooth semi-sticky dough – 8-10 minutes. 5. Towards the end of kneading, add in the cheddar cheese and mix until combined. 6. 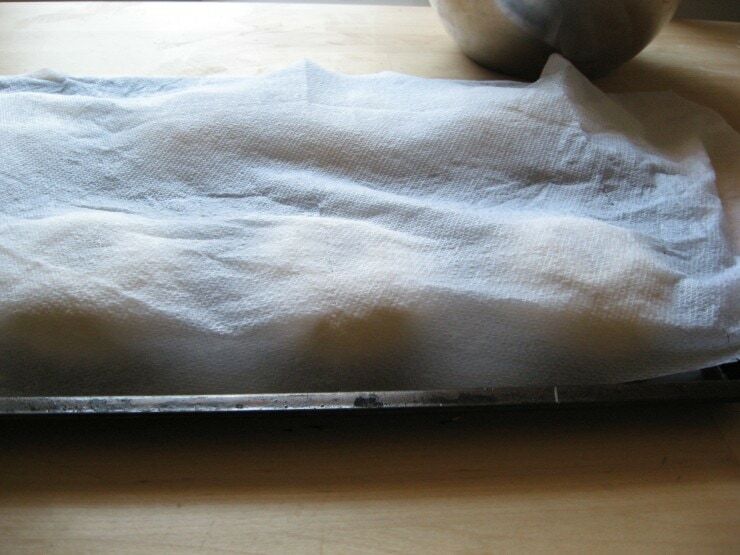 After kneading, let the dough rest, covered with a clean tea towel for 8-10 minutes. 7. Gather up the dough and knead gently for 30 second. 8. 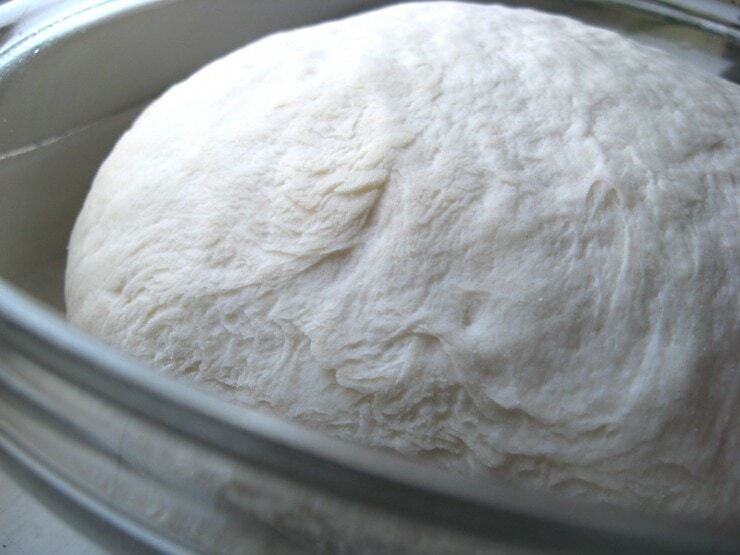 Place dough in a well greased bowl and let rise until doubled – about 1 1/2 hours. 9. Punch down dough and slice into 2 or 3 even pieces. Two pieces makes really large free form loaves. Actually I’ve never baked them in loaf pans. 10. Shape into balls & place on a baking sheet that has been sprayed with cooking spray. 11. Cover with a clean tea towel and rise again until doubled – about 1 hour. 12. Brush tops with an egg white that has been mixed with 1 teaspoon cold water. 13. Sprinkle grated Parmesan cheese over top. 14. Bake in a 375 oven for about 25-35 minutes or until crust is a golden brown. I like this best with chunks of cheese and finish by hand kneading it in. Sometimes I put in part shredded and part chunks. I’ll warn you that this is addictive! I usually keep one loaf and give the others away because I like it still warm from the oven. Vicky, Thanks so much for sharing your recipe for your Jalapeno Cheddar Bread!!! I will definitely be giving this a try!!! I’m sure it will be a huge hit with my boyfriend and my son! I made Pizza bagels that I adapted from this recipe. I modified the base recipe by substituting the “remaining hot water” with heated pizza sauce until the dough became pliable like bread dough. I also added cut up pieces of pepperoni in the dough as well. I added some pizza sauce to the “egg wash”. In the future, I am going to bake them for 12-15 minutes then add the cheese and finish baking them. These are definitely on the “To Make Again” List!!! Just made a different bagel recipe which did not come out so well. Can’t wait to try these. Right on. I’m not done making these (pre-boil stage, eh), but I’m happy to say that the “stretch the circle out” portion is giddily achieved by pushing your finger through the whole and spinning around your finger rather than pulling. Good times, great oldies. I did everything right and it all looked perfect till I put it in the oven which had previously been used as grill. Hi, your recipe is great, i do it all the time, i just have a doubt, if i double the recipe, should i double the yeas too? I made bagels yesterday with a recipe that called for easy-blend yeast. I only had active dry yeast, and did not let them rise long enough so they came out small and dense. I am going to try your recipe today. Many bagel recipes call for barley malt syrup – could this be substituted for the sugar your recipe calls for? The malt did provide a nice taste to the last batch, which had 1 tsp. added and added 1 T to the 2 1/2 quarts of water for boiling.